Experience African, Chinese, Jewish, Native American and other cultures through literature, celebrations, games and crafts. Each unit also includes an introduction, discussion of the culture's role in U.S. history, an extensive selection of recommended literature and a calendar presentation of significant events. The book concludes with a wonderful resource – reproducible illustrations of children from all the represented countries and cultures in native dress. The material in this book integrates easily into your present curriculum and will give your students a valuable perspective on their future. 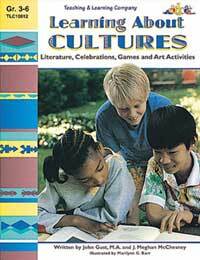 Chapters include: African American Culture, Arabic Culture, Chinese Culture, Japanese Culture, Jewish Culture, Korean Culture, Mexican Culture, Native American Culture, A Multicultural Museum.